Is there anything more wonderful than Opening Day? 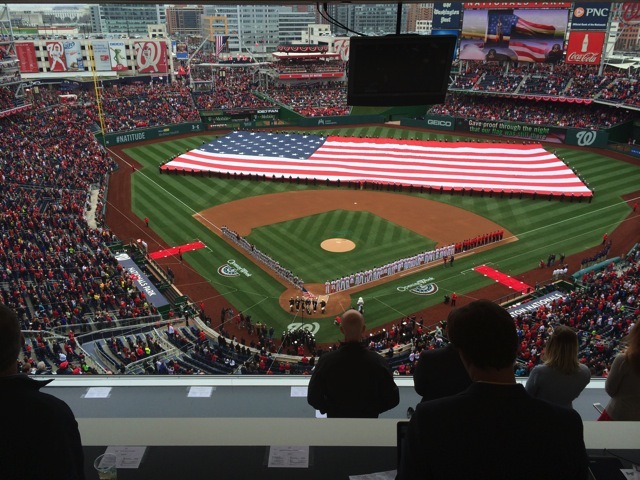 The pageantry at Nationals Park celebrating the start of spring and the season is always over the top, and today was no exception. Two of DC’s ladder trucks hoisted a massive American flag over Half Street, a drum line greeted fans as they came from the metro. The red-bedecked masses streamed out of Navy Yard Metro on an overcast Friday morning. An air of optimism was present, and the Braves fans were few and far between. Early on, Jordan Zimmermann, recovering from flu-like symptoms that scratched his start yesterday, was fairly well dominant. His 5-inning performance included nine strikeouts, one walk and just one mistake. It was the Braves’ chance to break through in the top of the fifth, as Mark Gattis obliterated a ball ten rows deep behind the visiting bullpen, but the Braves could not do more than chip the veneer on the just-recovering Jordan Zimmermann. The Nats looked to have tied the game on a bizarre play to start the bottom of the fifth inning. Ian Desmond laced a ball into the corner, where the ball rolled under the padding on the wall, and while Desmond sprinted around the bases, Jason Heyward threw his hands up and stood around while the ball remained under the padding. Desmond made it in well ahead of the throw. The following confab of umpires delayed the game for several minutes while the Park Avenue Blues reviewed the play for legality, and send Desmond back to second, as Heyward indicated he felt that he was impeded by the padding in the left field corner. Desmond would be gunned down during Lobaton’s at-bat attempting to take third, becoming the third National to be thrown out in the first five innings of the game. In the sixth, the Nats would finally tie the game on a Zimmerman fly ball, marking the first inning since the first the Nats would avoid a TOOTBLAN. Anthony Rendon singled to the begin the rally, was advanced to second on a wall, after which Jayson Werth walked, and Adam LaRoche hit into a fielder’s choice advancing Rendon to third at the cost of Werth, ahead of the Zimmerman sacrifice. While the rally was short-lived, it was enough to put the game back into control. Craig Stammen came on to relieve Jordan Zimmermann in the fifth, showing that the Nats’ two-long reliever plan was more wisdom than necessity, and Stammen would go on to blank the Braves’ offense for two innings ahead of the traditional 8/9 men. Tyler Clippard would give up a run in the eighth after issuing a leadoff walk to Jason Heyward on a single to Freddie Freeman and a sac fly from Chris Johnson. The Nationals would threaten in the eighth inning, putting Rendon and Werth aboard on a single and a walk, before David Carpenter would befuddle, confuse and outright beat Adam LaRoche, Ryan Zimmerman and Bryce Harper. Harper (1-4, 2K, TOOTBLAN) had a particularly rough game. Afterwards, asked if Harper was pressing, Williams was quick to defend his player, “Everyone’s pressing. Every day,” taking on the clichéd adjective as a perhaps the wishful thinking of reporters, to his credit. You never win them all, but you always hope to win Opening Day. 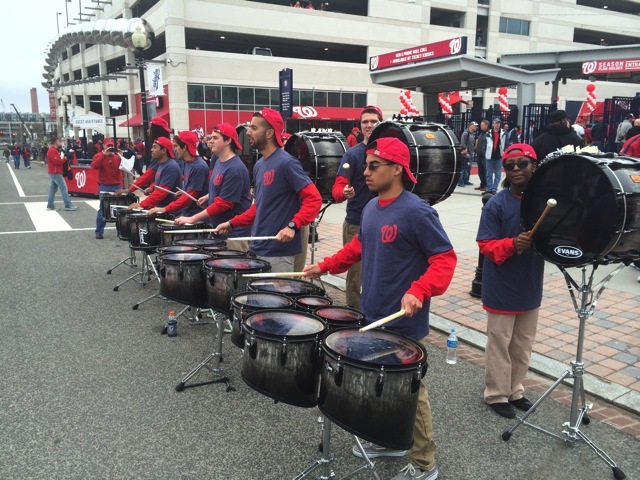 This was the Nationals’ first opening day loss since 2011, and their sixth in ten years. They’ll face the Braves again Saturday night at 7 and Sunday afternoon at 1:35.